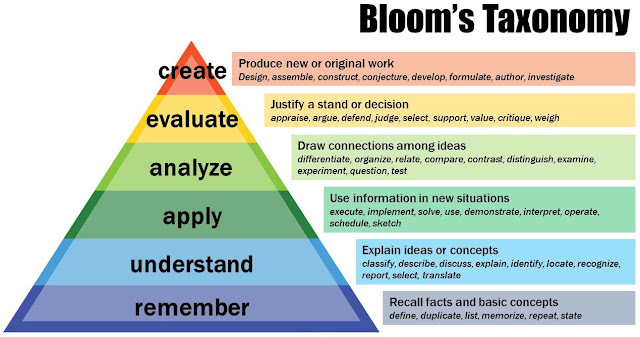 In 2001, the Bloom's Taxonomy was revised into the below form. It is the lowest level in the hierarchy and emphasizes on memorization without understanding. Learners will have to absorb, remember, recognize and recall information. However it is a building block for other levels as Learners must be able to absorb and remember things before moving up the hierarchy. Remember and Understand go Together, but Understand goes one step ahead. This emphasizes comprehending whatever is learnt. Learners should be able to describe the material presented and also be able to grasp and interpret prior learning. The emphasis is on applying concepts, laws, methods, rules, theories and any newly learned information to situations with minimal direction. Learning outcomes require a higher level of understanding than Understand. This is a higher level than Apply becuase here the emphasis is on understanding the content and structure of the information. Learner will have to breakdown information into various component and understand the relationship between each part of information. This may also involve understanding the abstractness or principles involved in each component of information. 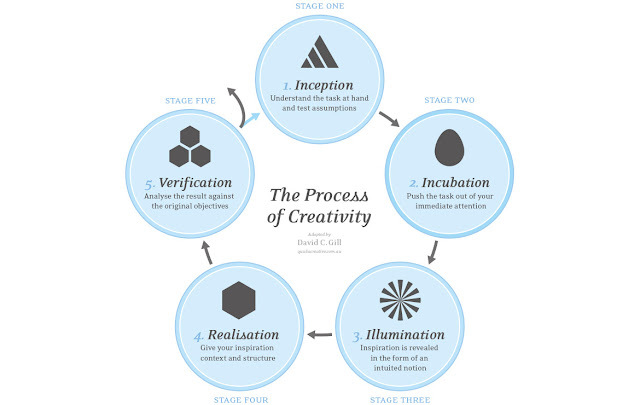 The highest cognitive abilities or outcomes are associated with Create. 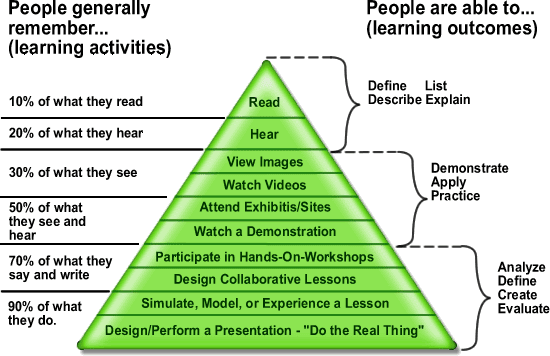 The ability of a learner to use all of the levels of the hierarchy to investigate, author, formulate, assemble and design absolutely new or original work. Edgar Dale was an American Educationist who developed the Cone of Learning in 1946. It is an effort to estimate or deduce the (amount of) information one can remember based on how they encounter information. The actual numbers (percentages) mentioned originated in 1967, based on a published study/article. The above figure is self-explanatory. On the left hand outer side of the cone, details on what an individual or learner will be able to remember based on the actual activities carried out is provided. On the right hand outer side of the cone, the outcomes of the learners on what they learner will be equipped to do (or be able to do) as a resultant of these activities. The center of the cone (or the cone itself) provides examples of the 'type of activities'. This includes examples of activities that are usually done by learners or advanced learners. - Companies that have their fundamental mission to make the world a better place have the greater chance to make a difference and to succeed. 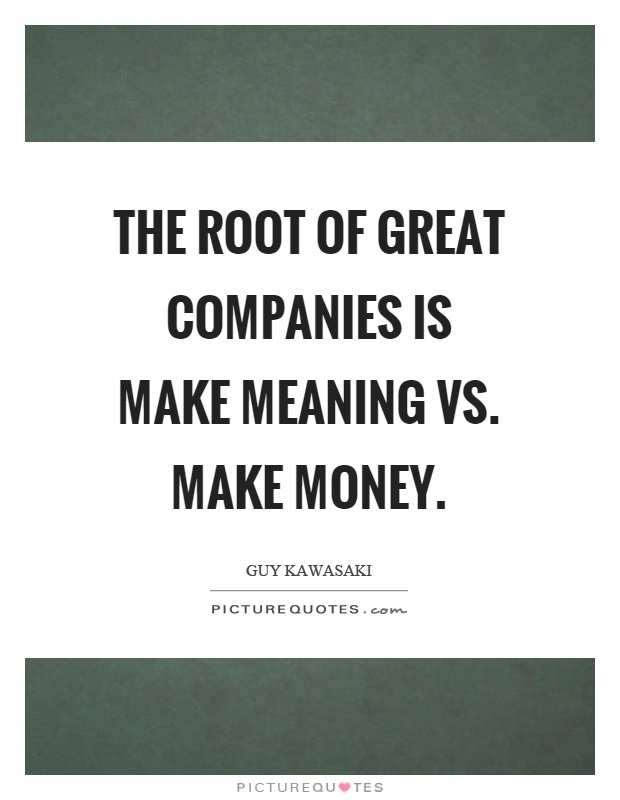 - If you make meaning, there is a greater chance that you will make money. 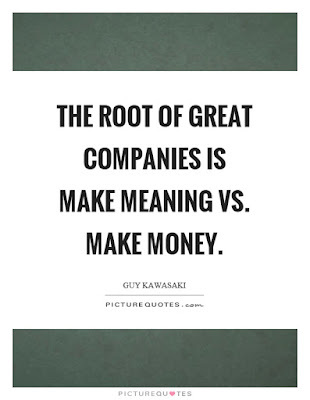 If you set out to make money, you may make neither money nor any difference to the world (meaning). - If you are not doing any of the three above, then you may have to rethink about your organization's purpose to be. A Buyer's Market is one in which the supply far exceeds the demand. In such a market, the chances of good lying on the shelf for a long time and the prices being lower than usual are the usual outcomes or characteristics. A Seller's Market is the exact reversal of the above conditions. This is the one in which the demand far exceeds supply. The seller's have an upper hand under such circumstances and the chances that there is a shortage of good due to quick sales of available goods and that too at a higher price than usual. There are various approaches to define Innovation. 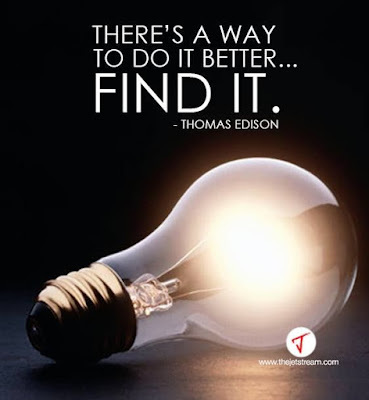 Innovation can have various or different meanings to various or different people. Since there are so many definitions for Innovation - As a student, I present the top 10 along with the sources or individuals who defined them. You may find individuals and sources from all walks of life providing their own perspective or a definition of Innovation itself. The remaining for you to find from the Internet as a TODO through your own efforts. Innovation is defined simply as a "new idea, device, or method". However, innovation is often also viewed as the application of better solutions that meet new requirements, unarticulated needs, or existing market needs. This is accomplished through more-effective products, processes, services, technologies, or business models that are readily available to markets, governments and society. The term "Innovation" can be defined as something original and more effective and, as a consequence, new, that "breaks into" the market or society. It is related to, but not the same as, invention. It is very important that one is able to appreciate the difference between Creativity and Innovation before getting ahead with further topics. Something new is not enough for the definition of innovation. There are plenty cases where something new has no new value ( a new color of a product or a new chemical produced that does nothing). Sometimes, the value creation results because the item is simply useful to us. 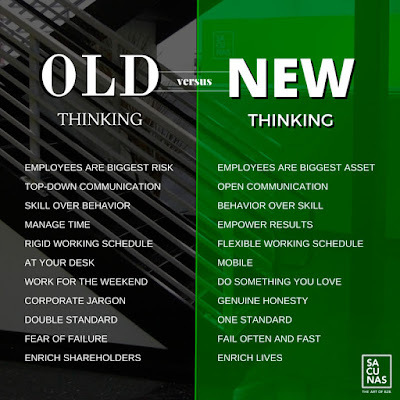 We can create a lot of fresh or new things that are of no use and no value. It must create value to be innovation. Also note that the “something” could be a process, product, or service and can start as small as your ideas and thoughts in your brain. In that case, it might just be innovative thinking. This piece form Business Inside Australia is apt in putting the right thought process across in an Organizational or Corporate Context, including Software Product Companies. Functional FixednessThe inability to use an object for something that it is actually meant for leads to Functional Fixedness. When one understands that a specific thing can be done only in a given way or that an object can only be used for what it was actually intended for, it leads to Functional Fixedness. Some individuals have the habit of wanting to execute the idea as quickly as it would have occurred to them. This would stifle creativity. It would be in best interest, most times, that we let the idea mature by asking further and probing questions to ourselves. This may lead to a discovery that no one could ever achieve before. This is true, especially for Organizations. If an Organization (or Individual) is not able to take risks then they will usually be working at their sub-optimal potential. It may happen that there is success sometimes and the other times, they may fail. Often, the learning potential from failure is far greater than from a success. Resource Myopia is usually a short-sightedness where the individual see thing as they are, rather than how they may be. We are usually unaware of our own strengths or of close our eyes to the resources that are actually at our disposal. If an individual is over specialized, he may be stuck with thoughts that are tried and tested. He may not be able to cross-pollinate or apply thoughts from across diverse fields or spectrums. Vertical Thinking requires one to solve problems through a sequential approach. Vertical Thinking which is the opposite of Lateral Thinking. It requires one to solve problems where creative and multi-directional thought processes are considered insensible. The transfer of habit from one activity to another allows for prermature judgement of various attributes in a situation. The habit transfer may be both positive or negative transfer. Verification : Testing Ideas against the Actual Outcomes. 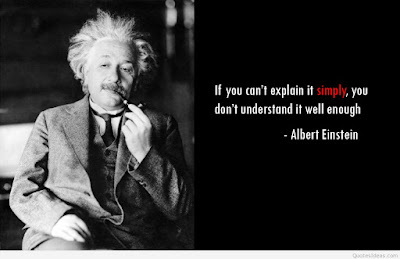 By Exposing Idea to further Analysis and Synthesis, we are able to judge its validity and judge the result. Ideas must agree to the original reasons of their origin and motivations behind their creation. If the idea does not sufficiently answer the Brief, take what is appropriate - discard the obscure and go to the stage one (Inception) and begin again. Check your Innovation Quotient #02 : Can you make 4 Equilateral Triangles with 6 Matchsticks? In how many different ways can you achieve this?